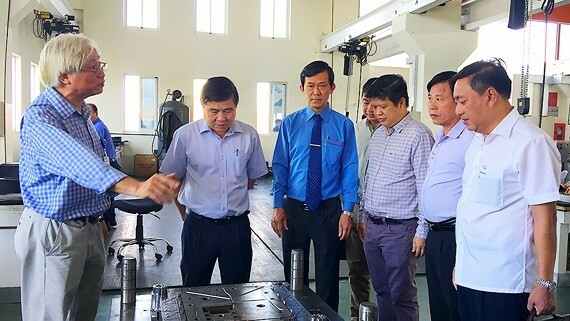 Chairman of the People’s Committee of HCM City, Nguyen Thanh Phong had a working session with more than 30 domestic mechanical enterprises on July 18. At the meeting, businesses expressed concerns about tax and investment support policies. Additionally, they are being treated unfairly compared to FDI enterprises by the authorities, especially handing over the lands to the investors. Duy Khanh Engineering Co., Ltd has not got an approved grant to be received the investment support fund after spending two years to finish administrative procedures. Lap Phuc Co.,Ltd. has aso spent a long time trying to wait for permission by the city’s government to expand its manufacturing plant. Meanwhile T.A.T Tools & Equipment Joint Stock Company has not received a land use rights certificate for over 17 years. The index of industrial production (IIP) in Ho Chi Minh City picked up 6.05 percent year-on-year in the first six months of this year, up 7.11 percent against the same time last year. Output of the four key industrial sectors, including manufacturing, electronics, chemicals-rubber-plastic and food processing rose 9.55 percent. The municipal authorities will choose key products to offer support solutions suitable to businesses’ operation, said Director of the Department of Trade and Industry of HCM City. Some enterprises proposed the municipal government to create market space for domestic businesses, speed up investing in industrial zones and offer rentals at affordable prices, launched articles on domestic product-using rate that should be imposed on FDI firms to support domestic companies to develop cooperation with FDI enterprises to enter global supply chains. Ho Chi Minh City has signed cooperation agreements with 50 cities and provinces of countries around the world. The HCMC Association of Mechanical-Electrical Enterprises should coordinate with the municipal government to enhance trade promotion effectiveness. Relevant departments should support and create favorable conditions for domestic mechanical enterprises to develop, concluded Chairman of the People’s Committee of HCm City, Nguyen Thanh Phong.